Curry Village has an uncanny resemblance to the penultimate stages of a Monopoly game, just before all the houses get converted to hotels and the most desperate dealmaking starts going down. With 180 cabins, 427 tent cabins, and a handful of motel rooms all fitting into a compact space, Curry Village has a higher population density than some cities. If you go on vacation to spend your time lounging around your home away from home, Curry Village isn't for you. The occupants of these cabins are probably from the "a hotel room is just a place to crash after a hard day's adventuring and possibly a hard evening's carousing, and by the way, do you remember where we left it?" school. At least they can take solace in being able to step out their front doors and see Half Dome - not a bad perk for residents of the Baltic Avenue section of Yosemite Valley. 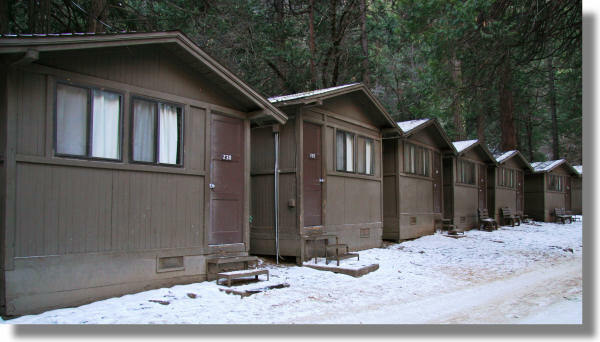 If you're looking for cabins with a bit more space between them, you might try renting one of the cottages at the Ahwahnee Hotel, or a cabin at the Evergreen Lodge in Camp Mather or the Pines Resort in Bass Lake.